This entry was posted on November 13, 2015 by Tinteán Editorial Team/EMcK, in Documentary, Film review, History, Irish Culture, News, What's On... and tagged Easter rising, film documentary, GPO in 1916, Irish culture, Irish history. Bookmark the permalink. Nature of event: ‘Battlefield 1916 – The Laneways of History’. Film Premiere. When: Tuesday 17th November @ 7pm. 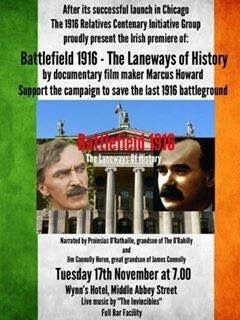 This Irish film premiere features the grandson of The O’Rahilly, Proinsias O’Rathaille and the great grandson of James Connolly, Jim Connolly Heron, taking a tour of Dublin’s forgotten 1916 Battlefield. It’s an honour and a privilege as the granddaughter (and family history researcher) of two 1916 Volunteers, both garrisoned in the GPO, and advocate for my 93 year old Mum who is a living link to the events of this period, to promote this previously untold history. The campaign to preserve this sacred area – the birthplace of our nation – is about promoting the legacy of these heroic men, women and children for future generations of Irish people the world over.